When it comes to autonomous vehicles (i.e. ones that can operate either in whole or in part on their own) the federal Department of Transportation (DOT) has said, "New technology, new rules" – but it needs your help. The DOT, in conjunction with the National Highway Traffic Safety Administration (NHTSA), recently released a 116-page report that gives information and guidance to automobile manufacturers, state legislatures, and other stakeholders on how to handle the quickly emerging—and ever evolving—technology. The agencies are formally requesting public input on matters dealing with everything from safety to enforcement, and because Pittsburgh is on the front lines of self-driving car technology thanks to Uber's autonomous vehicle trial being conducted in the Golden Triangle, we wanted to make sure folks around here knew about it. The statistics shared at the start of the DOT report, "Accelerating the Next Revolution in Roadway Safety" are compelling: Last year, more than 35,000 people died in car accidents—and a whopping 94 percent of those fatalities were the result of human error. While motorists may repeat the same dangerous driving mistakes time and again, autonomous vehicles do not. The hope is that self-driving cars will help reduce the surge in fatal motor vehicle crashes by eliminating the root cause: Driver error. Safety is a number-one concern for both the DOT and the NTHSA—and the car accident injury attorneys at Edgar Snyder & Associates share it. The report details, at least preliminarily, how safety rules will be developed, what exemptions will be permitted and how—and who—will regulate the budding industry. Self-driving vehicles will have varying levels of automation—and it's important that motorists understand what their responsibilities are when they are operating autonomous vehicles. 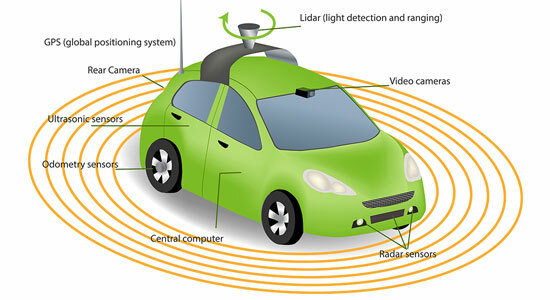 Highly autonomous vehicles (HAVs) may require no active participation by a human driver, while vehicles with lower levels of autonomy may require more attention and even some action on behalf of the driver. The question remains: How will driving dangers such as distraction be combatted? How do we prevent motorists from getting a false sense of security while being transported in HAVs? As more HAVs enter the commercial market place—and travel public roadways—it will be increasingly important to ensure the general driving public understands the technology, as well as the rules and regulations that govern their operation. The report is clear: Car manufacturers, their employees—even their marketing departments—must be ready to educate the public at large. Right now, the national spotlight is on consumer safety and how autonomous vehicles may help reduce the growing number of injuries and fatalities on U.S. roadways. Largely absent from that discussion, however, are the challenges emergency first responders such as police and fire departments may face as this technology advances. How will police departments regulate distracted driving as it relates to self-driving cars—especially when they have differing levels of automation? Different types of vehicles require different emergency responses. The report is clear: Training must be provided to firefighters responding to crash scenes involving HAVs. Fifty years ago, Congress enacted the National Traffic and Motor Vehicle Safety Act, which gave NHTSA full jurisdiction over the regulation of automobile design regulations. The issue of legal liability, however, has long been—and will remain—a responsibility that falls on state government. The Pennsylvania Legislature will be tasked with creating policy that addresses a question the personal injury attorneys here at Edgar Snyder & Associates have long been asking: Who is liable if an HAV is involved in a crash that causes an injury or death? How will insurance coverage change? Who will bear the financial responsibility? The driver or the manufacturer? Both? Also: How will insurance coverage change? In many ways, the DOT report raises more questions than it answers. And that's OK—this is one of those times when it's best to know what you don't yet know. The DOT admits: Its report is simply a first step, and introduction to the many complex issues at hand regarding autonomous vehicles. What comes now is a period of public comment, information gathering and data sharing. As the states work to create consistent, unified laws for manufacturers and drivers to follow, the DOT and NHTSA will be working on an update, which they expect to release in about a year. In the meantime, we will keep a close eye on what transpires in the Keystone State regarding the laws and liability related to self-driving cars.